The state of Gujarat does not stop exciting the country when it comes to renewable energy policies. Its new hybrid solar-wind energy policy is a perfect example of the same. The hybrid energy policy entitles the developer to use the same piece of land to generate energy from either solar or wind assets. In other words, developers will be allowed to set up wind power projects at solar projects sites and vice versa. This will enable an optimum utilization of land which is scarce in India. The hybrid solar-wind energy policy of Gujarat sets a perfect example of encouraging the adoption of renewable sources of energy. The state once led the country in terms of renewable energy generation and was regarded as a trailblazer of solar energy in India. The state generates more than 5,500 MW of wind power and 1,600 MW of solar power currently, taking the number to more than 7 GW from non-conventional sources of energy. The Gujarat government aims to add 1,000 MW wind power capacity and 2,000 MW solar power capacity each year for the next five years. The new policy not only entitles the effective use of land to developers but also allows them to use common transmission line to evacuate the generated power. As per the release, the transmission lines for the existing power projects can be used for the proposed renewable energy project. The benefits of the policy can be enjoyed by the approved projects for a maximum period of 25 years and the policy will remain in force for a period of five years. The policy also gives flexibility to the developers to decide the capacity of the wind-solar hybrid unit, based on the PPA with customers. 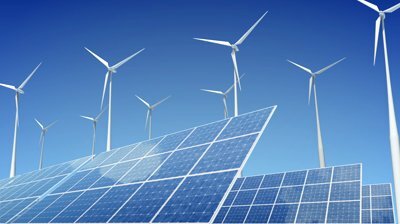 Developers can convert their existing solar/ wind project into a hybrid project or construct new wind-solar hybrid projects to be eligible. There are many other benefits of this hybrid solar-wind energy policy of Gujarat. No energy charges will be levied on the energy generated from the hybrid projects. In other words, the power generated at these sites will be exempted from electricity duty. A concession of 50% will be allowed for cross-subsidy surcharge when energy is sold to a third party and completely exempted in case the energy produced is used for captive consumption. Another 50% relaxation will be allowed in respect of wheeling charges and distribution loss. The hybrid energy policy of Gujarat should go a long way in boosting both wind and solar power generation in the state and reducing pollution to a great extent.